I Want to Hold Your Hand: The Start of Beatlemania in the U.S.A.
when ‘Beatlemania’ truly began and sparked in the U.S. In this country, we can chart it to late-1963 but it might have begun a little before then. The boys has already released their debut album, Please Please Me, in March 1963 and they also released With the Beatles in November of the same year. With two albums down, fans here could not get enough and it was clear this exciting new band were taking over the world! Unlike their debut album, there was a lot more original work from John Lennon and Paul McCartney. The debut had some cracking cuts but With the Beatles offered some of the best work from the band so far – including All My Loving. It was a busy and exciting time for the band and, in fact, second album was released in Canada with the augmented title Beatlemania! With the Beatles. That was on 25th November, 1963 and the magic of The Beatles was starting to spread. The boys had been releasing music for a little bit until that point but they were still fresh and new. The fact their music seemed to offer something exciting and embracing meant this fever and desire would heighten and explode. A lot of the music of the time (1963-1964) was quite safe and soft whereas The Beatles provided this rather intense and catchy Pop that was exhilarating. These four lads were breaking hearts and it would not be long until they stormed the U.S.
With the Beatles went on to sell by the case-load and people could not get enough of them! An important song that brought them to the attention of the American market was I Want to Hold Your Hand. The single entered the U.S. chart at number-forty-five just ten days after its release! It was the U.S. chart debut and the song became the fastest-breaking and fastest-selling in the history of Capitol Records! Many might say the fact the song started so low in the charts means one cannot truly call that the start of Beatlemania but it was a record-breaking disc and one that spent seven weeks at the top of the charts. The boys sort of went from promising and talked-about to these new icons. Many say their subsequent T.V. appearances in the U.S. – including appearing on The Ed Sullivan Show in February 1964 – was more important and meant they reached a larger audience. The Sullivan shows were vital but it was that chart entry and the fact I Want to Hold Your Hand rocketed that fuelled the passion. By The Beatles’ standard, it is not the most complex or audacious track. They would soon go to produce these complex and studio-stretching masterpieces but this was early days and they were trading in the radio-friendly, tight Pop songs that had an innocent message but were far more exciting than anything around. “Television ratings for the appearance proved astronomical. According to the Nielsen Company, a record-breaking 73 million viewers tuned in to watch The Beatles on “Ed Sullivan”—nearly 40 percent of the U.S. population at the time. Some newspapers still tried to dismiss the British hit-makers as a passing fad, but the numbers didn’t lie: Beatlemania had taken the United States by storm”. Fans and new converts could not get enough of this new track and a band who were like nothing else around! They would film their second live T.V. slot on 16th February and over seventy-million gathered around their sets. Even though the band would be able to do regular stuff – such as surfing in Miami – fans were hot on their heels. There were cases of fans cutting Ringo Starr’s hair and others who would launch themselves at the band’s vehicles. It was, in many cases, like it was a zoo but this was almost unprecedented. I can only think of artists such as Elvis Presley who created a storm but even he did not whip up such a typhoon of popularity so quickly! When the band arrived back in London, there was a crowd of thousands to greet them. The Beatles’ invasion of America was a success and it would lead to five Beatles songs entering the Billboard Hot 100. The T.V. appearances had broken records and it was a remarkable transformation – they came to America as a bit of a British curiosity but left on 22nd February as enormous superstars. We can chart the rise and biblical success back to I Want to Hold Your Hand entering the U.S. charts fifty-five years ago. Few could predict the song would take on a life of its own and it would see The Beatles become stars in the U.S. The track itself was to be bested pretty quickly and they would become more accomplished as songwriters – the sheer simplicity, rush and thrill of the track is the secret of its success! If they’d have launched in the U.S. with Hey Jude or A Day in the Life then I do not think that many people would be invested. 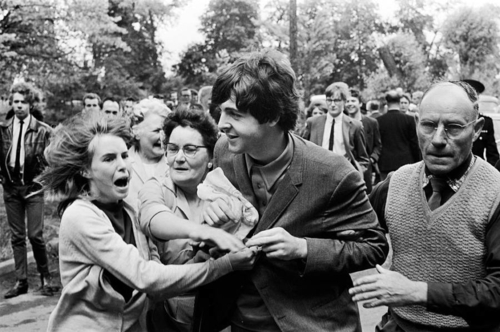 THE start of Beatlemania in America!